In recent years, all savvy tech companies are at least considering an Explainer Video to convey the value of their service. And, almost all leading tech companies have already produced one, if not many, videos to market their offer. Simply put: because an Explainer Video ensures that ANYONE who encounters their business quickly understands the value of their offering in the most optimal way possible. In this article, we discuss why video is no longer a “nice to have”. It’s an important REQUIREMENT for competing in the modern marketplace. Do your prospects really UNDERSTAND the value of your service? As technology gets increasingly complex, it has become very difficult for decision makers to understand the value that your service will offer them. Especially if they are from a non-technical background. Remember, decision makers are being “pitched” or “sold to” to all day. So when they are browsing your website, viewing your slide deck, reading your proposal or listening to your sales call, they also have plenty of other urgent commitments on their mind. Chances are, they also have 10 other internet browser windows or mobile apps competing for their attention at the same time. How many do you have open right now? So, some of your prospects and website visitors never really understand how much your service will benefit them. That’s why they aren’t receptive to your message. A PROFESSIONALLY produced Explainer Video changes that. Within 90 seconds they will understand EXACTLY how your service will help them … communicated in a way that engages them, and is easy for them to consume. Further, if your video is produced by experienced marketers, it will SUB-COMMUNICATE trust, credibility and experience for you and your brand. Take a look at this example, produced for our clients Secure Code Warrior. The platform itself is a technical training tool for software developers. Do your prospects know why they should choose you over your competitors? In the era of digital marketing, you need to assume that your prospects are seeing your competitors’ marketing. Customers search and compare your service with the click of a button on Google. If your competitors are backed by savvy marketers, then once your prospect hits your competitors’ website, they will start seeing their ads on every social media platform they visit, every day. 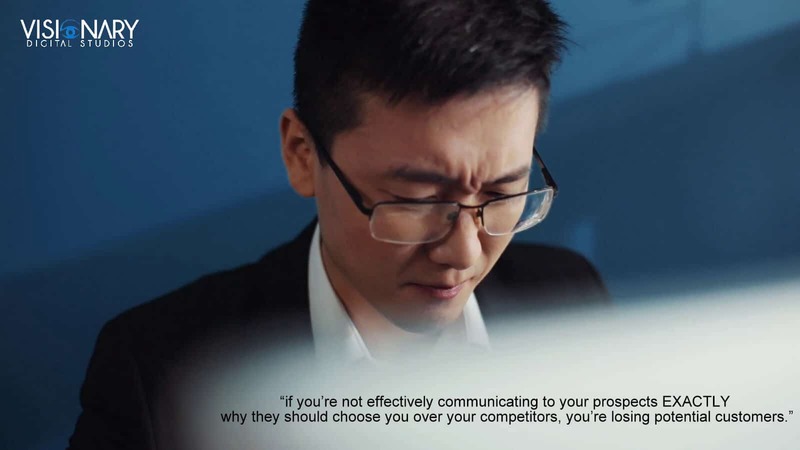 So … if you’re not effectively communicating to your prospects EXACTLY why they should choose you over your competitors, you’re losing potential customers. Because … with a powerful Explainer Video, which expresses the right marketing angles and subtly expresses why you’re the best fit for your market … your competitors’ prospects will now be seeing YOUR value proposition in their social media feeds! Experienced Directors know that business opportunities are not only about selling to customers. One meeting can lead to opportunities that redefine your business. This can be in the form of Joint Ventures or Referrals. Even attracting the right employees, investors, impressing conference attendees, finding vendors that want to work with you or being perceived as the experts you are. But if your network doesn’t properly understand what your business offers, opportunities simply can’t present themselves. 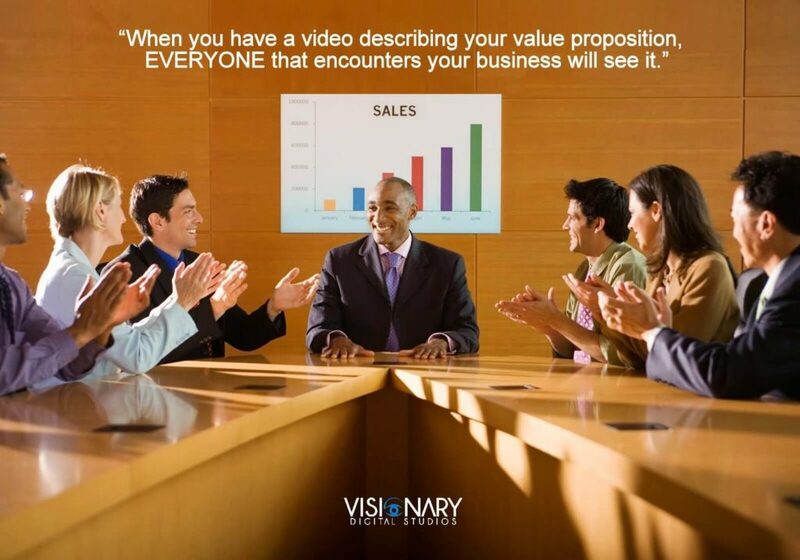 When you have a video describing your value proposition, EVERYONE that encounters your business will see it. When done professionally, your video will ensure that you have a powerful way to convey your business to your entire network. Could your current marketing and sales efforts be made more effective? An Explainer Video will make all of your current sales and marketing efforts MORE effective. Landing pages and websites will convert more leads. Your sales team will present a consistent message to prospects. Your proposals and presentations will stand out from the bunch. And your ads will be more effective. The statistics and evidence supporting this are everywhere. That’s why you’re seeing all leading tech companies using videos throughout their marketing programs. Will You Take Action? Or Stay With The Status Quo? In marketing and sales, there is a concept called “Status Quo Bias”. Loosely defined – it’s when a potential customer knows that they need a certain product, but can’t quite bring themselves to take action. It’s a frustrating “everyone loses” scenario, because all parties know that the product is a right fit and will bring massive value. I want to inspire you to take action now, rather than putting it off again. Then come work with The Visionary Team. Let’s convey the value of your service to the world, in the most POWERFUL way possible.